Dogs thrive on quality protein and healthy fats, which is why the Merrick Classic Puppy Real Chicken with Brown Rice & Green Pea Dry Dog Food is made with high-quality protein, whole grains, vegetables and fruits to provide a natural dog food formula rich in nutrients to support the overall health of your puppy. Merrick starts with real and wholesome USDA-inspected deboned chicken as the first ingredient with amino acids necessary for building muscle and a healthy metabolism. 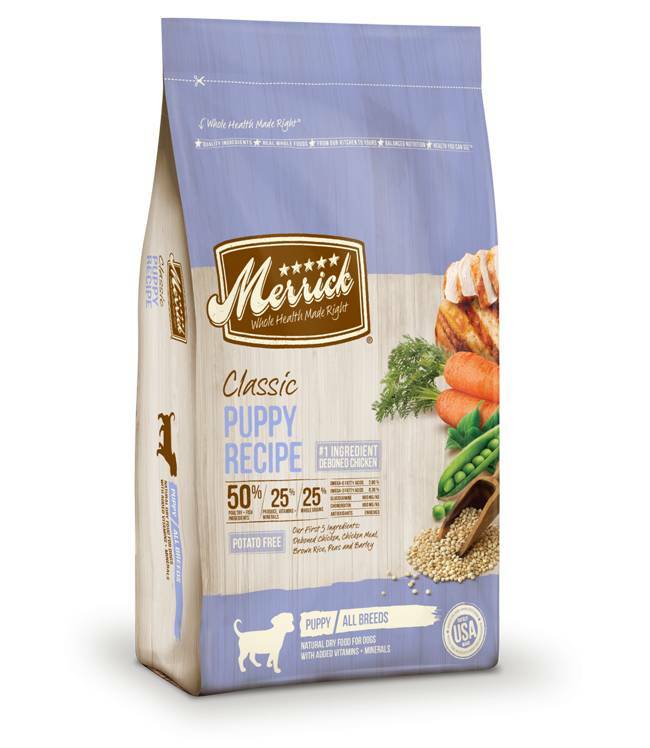 Our protein rich MERRICK PUPPY RECIPE is balanced with 60% poultry and fish proteins 20% fresh produce and 20% whole grains ingredients. This food revolution in the dog bowl yields 26% protein for each meal. Plus we add wholesome grains, vegetables and fruits to not skimp on all the good stuff your puppy needs. We have added DHA for healthy growth; omega 6 and 3 fatty acids, "fur friendly" nutrients, that help support a beautiful, shiny coat. Glucosamine and chondroitin help maintain joint health so your dog can run and play. Like with all of our recipes, we locally source our farm fresh ingredients to ensure the highest quality. As a result, Merrick recipes don’t contain any ingredients from China and our cooked in our own five-star kitchen and manufacturing facilities that uphold the strict guidelines well defined by the FDA.